Posted on November 14, 2014 by Chris White	in Advice, Be Yourself, Follow Your Dreams, Growth, Inspirational, Luck, Motivational, Politics, Self Healing and tagged Cracker Jacks, Growth, Happiness, inspirational, Love, Love of my life, marriage, One True Love, Prize in the Cracker Jacks, Soul Mates, True Love. My whole life I’ve heard about the idea of true love. There are many ways to express it (i.e., real love, made for each other, perfect partners, soul mates, numero uno, love of my life, my one and only, etc.) but how many people out there can really comprehend the idea of such a thing in its full context? We’ve all had our ups and downs and most of us end up tied to someone special eventually but are you truly with your “one true love” or did you just settle for someone just a little less perfect than you expected? Most people can’t wait to get married. Sometimes it’s because they just want to get out of a bad home environment or sometimes it could be that they just want to grow up and move on with life or perhaps it’s because all their friends are getting married and having kids and they think they’re supposed to do the same thing. But when you’re young and fresh out of school you’ve not lived and navigated through enough personal relationships by which to judge whether your current person is really the best person for you or not. That is why statistically more marriages fail than survive. I’ve blogged about the idea of perception versus reality several times because I truly believe that each of us have our own special reality shaped by several things including nature (DNA), nurture (parenting and mentoring), and experience (what we do with both of those things). To truly experience something as rare and complex as finding your soul mate, don’t you have to live just a little? We also have to suffer just a little in order to appreciate just how low things can be with the wrong person. Experience develops our individual perceptions and helps us to recognize not only what is special about a person generally…but what is particularly special about that person from our own perspectives – through our own jaded and subjective eyes. These are two distinctly different things. I’m sure there are a few very lucky people out there who were fortunate to find that special someone on their first try but I seriously doubt the probability of that happening very often. Most of us think we know, then proceed to jump off the proverbial cliff of sanity directly into a pit of uncertainty then swim against the current in the river of probability then drift slowly toward an ocean of insolvency and finality. Those are not great odds. To make it worse, our own ego sometimes refuses to allow us to quickly resolve a mistake and let go before we become so entrenched that leaving becomes problematic or even dangerous. We fail mostly though not because we hitched our wagons necessarily to bad people but because we had no idea who we were in the first place. Our idea of what a relationship should be is just as undeveloped as our sense of who we are or what makes us happy. How can we begin to address the issue of what we can do to please another person when we’ve ignored our own needs and wants? That’s not selfish, it’s absolutely critical. If we ignore what’s inside, foregoing that critical component of personal happiness and instead focus on making someone else happy, then we are doomed to eventually implode with anger and expectation of reciprocation. But it becomes unfair to the other person because they’re expectations are based on who you started off as, no matter how unrealistic it may seem. Well, I’ll let you in on a secret. When you give yourself an honest opportunity to figure out who you really are, forgetting about the idea of love or marriage, the internal images of prospective mates is suddenly illuminated. Sort of like the secret decoder ring in the box of Capt. Crunch, you suddenly have a magical lens by which you see the world that illuminates that which is good and healthy and filters out that which is…maybe a bit unripe. That’s a kind way of saying that sometimes people who will eventually become great partners start off with no idea of what being a great partner is and will potentially hurt you. We are not all ready at the same time or at the same age. Thus, a great partner for me may not make a great partner for you. No matter how awesome my wife may think I am for her has no bearing on whether I would be viewed as equally awesome to another person. 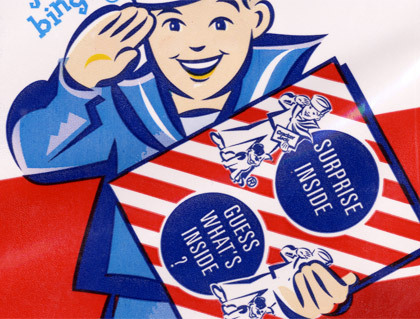 We’re all like big irregularly shaped boxes of Cracker Jack’s. We all have a little prize inside but since we’re all looking for something different, the value of that little prize weighs more or less to whomever it is that gets to open your prize package. Some folks may love that little magnifying glass you have but I just think it’s cheap. So, here we are, you with a cheap magnifying glass and me with an awesome rubber ball. On a higher note, just because one person doesn’t fully appreciate the value of what’s inside or what you have to offer, doesn’t mean that someone else won’t. After my divorce, I was single for 16 years. There were moments where I thought I’d be married again and moments where I believed I’d be single my whole life, mostly the latter. I think my son was more worried about me than I was. There were times when I embraced the idea of being single and times when I wept about it. There were girlfriends along the way, some good, some better, but with each failed connection I was forced to excavate the archaeological remains of failure and grow a higher understanding of me. Initially I had this superficial mental idea of who I was supposed to find, not realizing that there was a real person inside of all that perfunctory shallowness. Then slowly but surely I got to know me better which added some depth to my minds-vision of who I should end up with. The best way I can describe it is like comparing a road-map to a relief-map – with all the mountains, rivers, bumps and valleys to provide some perspective. When you’re ready, your like a blind person reading braille – you can feel your way along the route. For me, it took a little while longer than it does for most people. When I first met Emily there were no questions and no concerns. I already knew her from my mind. I wasn’t looking for a hair color or a particular personality, I was looking for her and there she was. But even though I had that initial easiness about her, she wasn’t all that prepared to meet me. She believed, like I did, but wasn’t ready to accept it until about a year later. There were, of course, obstacles to overcome and trust to establish but the hard work was done internally in both our minds while we both recovered from previous bumps and bruises. Fortunately for me, she was looking for me too. All I had was this stupid rubber ball but it turns out that she loves stupid rubber balls. I got the better end of the stick. It turns out that her Cracker Jack box was chocked full of generosity, kindness, a sweet spirit and awesome twice-baked potatoes. In my mind, my rubber ball really didn’t really compare to all that but I guess it must have been exactly what she was looking for because it turns out that Emily is my one-true-love. She is the perfect person for me. Seven years of marriage, some seriously screwed-up butter cream cake-frosting, a job related police-raid, failed business venture and tumultuous local election later and we still love spending time with each other and she is still bringing me breakfast in bed. Not only do I love her immensely, but I can feel how strongly she loves me too. When you have what we have, you never feel jealous and you never feel insecure. No matter how our bodies evolve through age or how many mistakes we make, the love we have for each other is always profoundly present. True love, soul mates, perfect partners…call it what you want. There are so many bad things that never enter your mind when you’re with the right person. Similarly, there are so many good things that are always on your mind when you find that certain someone. It’s a wonderfully liberating, incredible, and rewarding feeling to be with the one person in the world who really knows you inside and out, loves you unconditionally, gets all your jokes, and still wants to spend time with you regardless. When you read some of my jokes, you may understand just how lucky I truly am. I’m so happy you found each other I love you both! Another Great Article. I forwarded this to my Kids. Have a good week-end.